Beyond a shadow of a doubt, learning to read is incredibly important. Without that basic skill, people can be effectively "left behind" in society, which can lead to a struggle for social and financial survival. The majority of the industrial world uses the Internet to stay connected. Thus, being able to read at least one language is becoming even more critical than ever before. Though it may have been possible in past generations to be illiterate and still "get ahead" in business, that opportunity no longer holds true. Without the ability to read, men and women cannot hope to obtain employment that offers much chance of advancement. And even many jobs that are low in terms of pay scale require that the employee know how to read and write, such as a server in a restaurant or a clerk in a retail store. Traditional schools operate on the assumption that (after a certain age) all students will be literate. Those who cannot keep up early in their educations may find that they are never able to "catch up" without serious intervention. From a social standpoint, being illiterate may cause embarrassment and contribute to feelings of low self-esteem. Consequently, it can be incredibly difficult for teens and adults to reach out and get the reading help they desperately need even if they want to because of preconceived notions and stigmas. Without the Skills to Read, an individual could have significant difficulties in day-to-day living. For example, those who are illiterate often have trouble understanding how often to take medicines as well as how much to take at a time. The results (of the aforementioned scenario) could literally be lethal. Many studies have found that a substantial percentage of those who are incarcerated cannot read (or are reading at a very low level for their ages.) The strong connection between crime and illiteracy has been well-established, and recidivism rates seem to decrease when prisoners attend literacy programmes offered by correctional institutions. Being unable to read could push a child away from making friends, thereby causing him or her to adopt a life of self-generated isolation. Without a peer group, he or she may be less likely to be comfortable in social situations. Traveling is very hard for those persons who cannot read or write. This means that an illiterate person may have little opportunity to explore new cultures, thus keeping him or her from experiential learning. 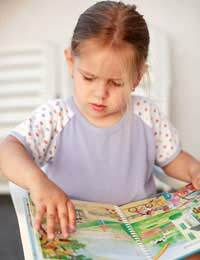 Children who have difficulty reading and/or are told that they are "illiterate" often stop wanting to try to read. Consequently, staying positive is critical to overall success, even if you are a parent who is frustrated by your child's inability to learn. Books, magazines, poems and plays have the ability to transport readers to other places and times. But if a man, woman or youngster cannot partake of this enjoyable pastime, he or she is denied passage to faraway places and educational passages. Questionnaire: Is Your Child Ready for Chapter Books? Questionnaire: Does Your Child Like Reading?